Congratulations to grandson and nephew, John "T", of the Bendick Family on his new job with the FDNY/EMS. He was sworn in today (February 11th) and he will begin his training at Fort Totten in Queens by the end of the month. John "T" is a great young guy and I have confidence that he will be an asset to the FDNY/EMS, as well as the citizens and visitors to New York City. I understand that his previous place of employment gave him a party in appreciation for the job he did during that employment. Even a few employees who were off for the day stopped by to wish John "T" all the best. Of course his grandfather, Retired FDNY Capt John Bendick, and his uncle Active FDNY Lt Tommy Bendick, are the administrators of this web site. Best Wishes John "T" for a safe and happy career with the FDNY/EMS. 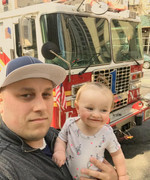 The latest Progress Report on John "T", the Grandson of Retired FDNY Captain John B., (site administrator), and Nephew of FDNY Lt Tommy B., (site owner) with his on going training with the FDNY/EMS. I am being told by his grandfather, John B., that he is doing very well. His test scores have been very high. John "T" as he is known, is getting himself some required "hands on" training these days/nights riding with the members of the busy FDNY/EMS Stations 19 on Jerome Ave and Station 27 on East 233rd St - both in the Bronx. I have known John T for a couple of years and I am sure that he will be an asset to the FDNY/EMS and be directly involved in helping hundreds of people. No doubt he will have a huge impact on saving many lives within the city. It's nice to know that we still have some younger individuals out there that we can all depend on in our time of need. As many of you already know, we have Charlie T., aka "memorymaster", who has retired from the FDNY/EMS as a boss (Lt., right Charlie - ? ), a frequent contributor here, and also one of our newer members to our site, Phil D., aka "Lebby", who is currently assigned to EMS Station 16 in Harlem. We salute them for their life saving services as well. Thanks Guys.
" Relating to Our Upcoming "Member Get Together" on May 11th, I understand that young "Probie Wanna Be", Gracian Bendick, (see above photo) will be making a Special Guest Appearance." FANTASTIC ! What a TERRIFIC Young Man. I myself; and I'm sure the other Members, look forward to Welcoming this Wonderful New Guy aboard. Brad that is GREAT. Yes, "they got the makings". I remember my father bringing me to the firehouse when I was about 4 years old. He did the same thing with my brother too. A few years go by and whenever we hear the fire trucks, my brother and I would be on our bicycles trying to find out where they went. These days we may not chase the fire trucks on our bicycles anymore. But not a day goes by that we don't mention something about the fire dept. Looking back, it all started about 60 or 65 years ago when he brought us to that firehouse. Brad, 20 years from now, those pictures you posted might tell a story that started back around April, 2019. For many of us on this site, particularly our more senior members, we have been following the tread titled: "The Ventures/Days of Doo Wop", in the General Discussion section here. A frequent contributor to that thread is a member who calls himself "memory master". His real name is Charlie T., and he is a good personnel friend to several members of this site. We know that Charlie has retired from the FDNY/EMS and also worked within the former NYC Health and Hospitals EMS covering the city before that merger. During his years he worked in some of the busiest areas of the city, where he rose up in rank to I believe, Lt. Without any doubt in my mind, he has had a "direct impact" on saving thousands of lives and helping so many during those years. How do you thank somebody who has done so much good for so many people ? I have never actually met Charlie but I feel as though I've know him for years. We keep in touch quite often, mostly through email. But what I also wanted to say is that Charlie T., aka "memory master", has a wealth of knowledge when it comes to the music of those Doo Wop Days. Those of us who have viewed that thread, "The Ventures/Days of Doo Wop", can confirm that. However, I recently learned that Charlie goes much deeper into it than posting his comments on there. I just received an email from him. He calls it "Memory Masters Music". As I went through it, I could NOT believe the huge amount of work he put into this. He has listed over 3,200 albums and cd's that he has in his collection. Not only does he have that entire list, but he has also broken down each album and cd containing the "artist", "title", "genre", "disc", "tracks", "release date", "label" and "added data". It is an UNBELIEVABLE PIECE OF "CLASSIC" WORK. What a Great job he did. I don't know if there's any way that he could post it on this site for ALL the members to see. But I'm sure there are other guys here that would certainly enjoy seeing it and be as impressed with it as much as I am. THANK YOU Charlie, aka "memory master". Thank you for all you do for us here and we certainly THANK YOU for the Life Saving Job that you did for so many years. In most likely the "busiest and most dangerous EMS organization in the World". During my younger buffing days, I saw you guys work too. "The Webster Outpost" on Webster Ave in the Bronx was a favorite of mine. Tough place to work. Quick story, a civilian was hit by a car near the Butler Housing Project. A large crowd gathered around the only two NYC Health and Hospitals EMS workers on the scene and the neighborhood people weren't too happy about it. Not only did those NYC EMS guys have to worry about the patient, but they also had to worry about the crowd too. Plus there was the "aids" thing that came out with thousands in NYC infected. This is just one small story that so many people like Charlie T., "memory master", had to deal with. Let me also say this. This "NEWS of MEMBERS" thread merely scratches the surface of some of our members here. There are so many more stories to tell. But where do we begin ? Thank you Willy for your kind words. I would love to post the collection on the site IF I knew what I was doing. The actual base for my collection info is from www.collectorz.com They offer sites for music, dvd, book, etc. collections. The hard part was/is manually entering each article, tracks, dates, incidental info, etc. but it is a labor of love which is not yet complete. I'll see what I can do about getting it out onto the site. JohnnyGage - welcome to your baptism of fire, so to speak!! JohnnyGage - Don't feel so bad. I've been here 12 years and they still treat me like a Probie. A couple of announcements to make regarding a few of our members. Nycfire.net member Steve E., aka "fltpara16", tells us that his daughter was recently married and they are now on their honeymoon in South Africa. We wish the couple many Happy and Healthy years together. Congratulations to both, as well as the father of the bride. We know that Steve E., "fltpara16", is a Battalion Chief in the Albemarle County Fire Dept in Virginia, where he covers the entire county as the only B/C on duty during his shift tour. We also know that a few of our members here have rode with him as his B/C aide on several occasions. Now with his daughter married and several years with the department, could a retirement be in the near future for this great guy who many of us consider a personnel friend. We now bring you News regarding another member of this site who many of us know as well. Bill J., aka "Parkave32", recently reported that both he and his wife, Jane, sold their Bronx, Throggs Neck home in November, moving to Tennessee. Just outside of Nashville. Bill J., had retired after a career working at Hunter College in NYC. Seems that the Most Reverend Elwoood E., aka "CFDMarshall", won't be the only one coming up from Tennessee next month. Bill J., reports that he and the Mrs plan to come back to NYC next month where they plan to attend the 40th Anniversary of the Throggs Neck Volunteer Ambulance Organization, where they both meet in 1979. In addition, members Steve E., "fltpara16", and Bill J., "Parkave32", plan to join us for the May 11th Get Together of members from this site, as well as members of FDNY etc. Of course the Most Reverend Elwood E., "CFDMarshall", from Tennessee will be there as well. We are gonna need a Southern dictionary to understand all these Southern folk, y'all. Ray, last time we saw Rev Elwood, "CFDMarshall", he didn't have a beard like that.